Today's review comes from David Salas, a student physical therapist from my alma mater Western University of Health Sciences. David was (and is working his way back to being) a very fast collegiate runner and has a great interest and knowledge of running. He was kind enough to lend his thoughts on a pair of the Altra Golden Spikes. Read on for more! A true XC spike, the Altra Golden Spike is a shoe that has grown on me quite a bit after a few runs. Running through all terrains, it runs smooth as butter through grass or all-weather tracks, a firm road flat through dirt, and a super firm ride on concrete. The shoe almost seems to be best described as a natural feeling track spike that carries over grass and dirt incredibly well. The Golden Spike takes a little different approach to a cross country spike. With the zero drop, wide toe box, and a firm ride, it makes for a very natural feeling run. The best that I can describe it to would be striding barefoot on a turf field. The shoe doesn’t have much cushion, but springs off of soft surfaces incredibly smooth. The shoe has a synthetic upper and fits a little wider than other spikes on the market. It breathes well and is built durably. This shoe is definitely a bottom heavy shoe (as are most XC spikes), for the upper hardly carries any weight at all. The fit is very true to size as I typically wear a 9.5 and that is exactly where the shoe fits. I would not suggest sizing up as this is a racing shoe meant to fit closely (but that will depend on how you like your shoes to fit). The synthetic upper fits comfortable around the foot especially around the toes. The Golden Spike fits narrower than most traditional Altra offerings but still allows for appropriate toe splay in a close fitting cross country spike. The Golden Spike, like all other Altra shoes, has a zero drop platform. Normally this feels a little off for me when combined with the softer high cushioned shoes that Altra normally has on the market, but this is not the case with this spike. I really appreciate the zero drop in this situation. Normally, spikes feel pretty darn aggressive with a negative heel approach (indirectly with a raised spike plate and spikes inserted). The negative heel set up normally seen in spikes places a large demand on the calves. I find that the Golden Spike still feels responsive and is a little less harsh on the legs with the zero drop approach. Different than many other spikes, the Golden Spike also has a wide toe box. Breaking it down mechanically, the little bit of extra room combined with zero drop provides a natural ride that dissipates forces a little better than other shoes on the market (to be discussed in more detail in the next section). For some, this could actually a be a deal breaker, but for people who naturally have more of a supinated running pattern this could prove to be quite comfortable. The Golden Spike is more rigid anteriorly, hovering around the ball of the foot. This provides a springy feeling when one runs in it. The spike plate is also built into the sole of the shoe and isn’t raised, taking a non-aggressive approach. The outsole combined with the spikes provide a ton of traction that allow for fantastic corning at high speed without any slippage. 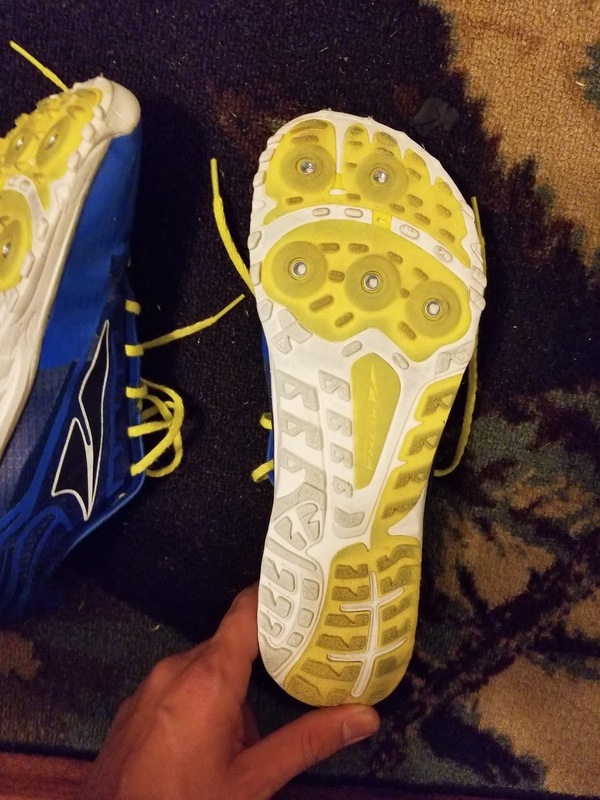 This is rare for an Altra shoe as most of them are high volume in the upper, but the closer fit combined with the grip makes for a perfect fitting natural competition shoe. For this section I will take a biomechanical look at the zero drop and wide toe box discussed earlier. First, before any discussion: This shoe is not for everyone, but if you run like me you may also feel the benefits. I run with a more supinated/inverted forefoot pattern, resulting in an already aggressive running form. Now here is why I like this XC spike for a running pattern like mine. Editor's Note: From observing David's running pattern, he lands in a very inverted (sole of the foot pointing in) foot position and rolls inward (aka pronates)... sometimes. He also at times actually rolls outwards and stays supinated from heel to toe or toe to toe (instead of resupinating AFTER pronating to absorb shock). So his gait adapts to changes in terrain and whatever is going on biomechanically up above. We worked on some hip weakness early that seemed to reduce some excessive loading issues toward the feet. The important note is that you should never just look at the foot. Often what happens there is a result of mechanics and movement up higher. The Altra Golden Spike facilitates a more shock absorbing friendly pattern: I have had two tibial stress fractures over my running career. In large part, this is due to my aggressive running pattern. When running, it is natural to have an eversion and pronation moment in the initial and mid stance phases of running (yes, I just said it is natural to have a pronation moment, as long as it resupinates in the “spring off phase”). This eversion and pronation moment unlocks the foot, resulting in increased force dissipation across all of the bones of the foot before climbing up the kinetic chain (helping out our poor navicular and tibia!). If you don’t pronate much at all when you run, you lock in the sub talar joints and send the landing and pushing off forces to the navicular and tibia. The Altra Golden Spike facilitates a little eversion moment at the stance phase to help with that force dissipation. Why am I talking about all of this? It is because of the clever zero drop and wide toe box addition to a spike. First, the zero drop places a little less strain on the calves than other spikes, which could be really nice in the latter parts of an XC race if one does not have sufficient calf strength built up. The way the sole is built incorporates a little more upper kinetic chain activity in the glutes and quads than the normal negative heel approach. The wide toe box is what helps with that eversion moment (mostly indirectly and more of a facilitation than anything). Most spikes are narrow upfront and promote a locked foot position. You can generate a lot of power with this build yes, but it tears up your calves and can leave your feet really uncomfortable, especially if you already run that way without spikes on. 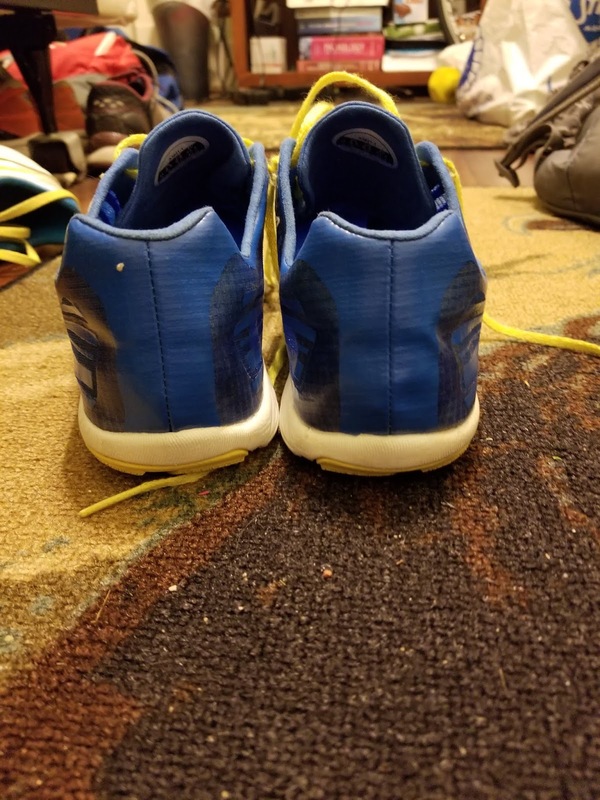 The wide toe box allows for just a little more movement up at that mid and forefoot and doesn’t press on against your toes and feet the moment you begin to pronate. Instead, it lets that pronation moment go for a little bit, and then presses against the toes to facilitate that resupination moment. This is nearly identical to how the foot is naturally designed and doesn’t sacrifice any force or power generation when running fast. Editor's Note: As David is saying, the wider toe box and true zero drop platform (not negative drop as often happens with the raise spike plate in many competition shoes) may promote more natural pronation and foot mechanics. Your feet will spread a bit upon impact, which is an important method of shock absorption. Further freeing up the forefoot allows for a better positioning of the first toe, which is crucial for the resupination moment as you progress forward to toe off. The peroneus longus anchors there and helps facilitate the normal function of that area along with the powerful calves and posterior tibialis resupinating the foot. Narrow spikes can definitely squish the feet and limit the function of the the hallux (big toe) in some people, while others may be able to get away with this. Why not design a natural fitting spike that allows all the parts to work correctly? I for one am happy to see a more comfortable fitting and naturally designed spike. I look forward to the evolution of this shoe and hope to see a pure track spike version at some point. Although the Vanish-R may have that spot now. For those looking for a XC spike that feels like a track spike over grass and dirt, you found it. The Altra Golden Spike is a great option that is responsive and light (5.7 oz.). It isn’t the most comfortable over concrete, but it is tolerable. 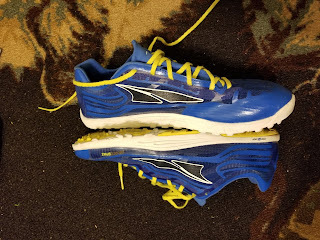 I would further like to add that I would especially recommend this spike to people who run with a more aggressive forefoot strike and supinated pattern, for this shoe facilitates just a little bit of eversion/pronation, resulting in a more natural and shock happy ride. If you already have pronation when you run, this shoe may come off a little unsupportive but should still have some spring in the step. With how firm this shoe is, it should definitely be used for faster training and races. ***Disclaimer: These shoes were purchased for their full retail price. This in no way affected the honesty of this review. We put at least 50-75 miles on trainers and 10-25 miles on racing flats prior to reviewing them. Currently David has 34 miles on his pair. My views are based on my extensive history in the footwear industry and years testing and developing footwear. If you are a footwear rep looking for footwear reviews or consultations on development, we are currently looking to partner with companies to assist, discuss and promote footwear models. Partnership will not affect the honesty of our reviews.